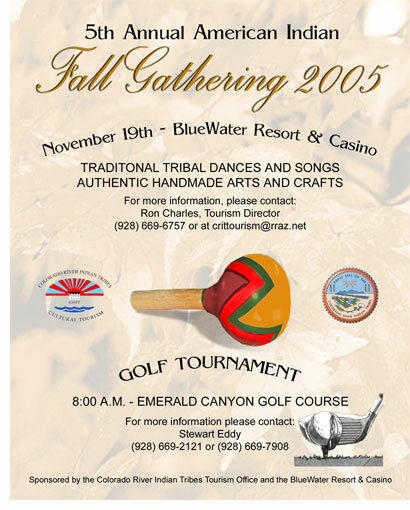 CRIT will host the Fifth Annual Fall Gathering 2005 on November 19 at the BlueWater Resort & Casino. All Tribal and Native American communities and members are invited to participate in the event, which is also open to the general public. The event is sponsored by the CRIT Tourism Office and the BlueWater Resort & Casino. The event starts at 2 p.m. It is a cultural and dance event that promises to be a fun filled experience including Native American dance groups, art and other activities. The event will focus on the preservation of authentic traditional tribal dances and songs, and authentic handmade arts and crafts. For more information, please contact Ron Charles, Tourism Director, at (928) 669-6757 or at crittourism@rraz.net.